Species counterpoint is a type of so called strict counterpoint, developed as a pedagogical tool, in which a student progresses through several “species” of increasing complexity, always working a very plain given part in the cantus firmus (Latin for “fixed melody”). The student gradually attains the ability to write free counterpoint (that is, less rigorously constrained counterpoint, usually without a cantus firmus) according to the rules at the given time. The idea is at least as old as 1532, when Giovanni Maria Lanfraco described a similar concept in his Scintille di musica. The late 16th century Venetian theorist Zarlino elaborated on the idea in his influential Le institutioni harmoniche, and it was first presented in a codified form in 1619 by Lodovico Zacconi in his Prattica di musica. Zacconi, unlike later theorists, included a few extra contrapuntal techniques as species, for example invertible counterpoint. A succession of later theorists imitated Fux’s seminal work quite closely, but often with some small and idiosyncratic modifications in the rules. A good example is Luigi Cherubini. The final must be approached by step. If the final is approached from below, the leading tone must be raised, except in the case of the Phrygian mode. Thus, in the Dorian mode on D, a C# is necessary at the cadence. If writing two skips in the same direction (something which must be done only rarely) the second must be smaller than the first, and the interval between the first and the third note may not be dissonant. The interval of a tritone in three notes is to be avoided (for example, an ascending melodic motion F – A – B natural), as is the interval of a seventh in three notes. In first species counterpoint, each note in every added part (parts being also referred to as lines or voices) sounds against one note in the cantus firmus. Notes in all parts are sounded simultaneously, and move against each other simultaneously. The species is said to be expanded if any of the added notes is broken up (simply repeated). 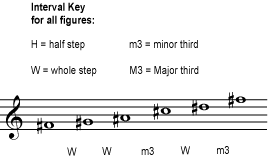 In the present context, a “step” is a melodic interval of a half or whole step. A “skip” is an interval of a third or fourth. (See Steps and skips.) An interval of a fifth or larger is referred to as a “leap”. Avoid parallel fifths or octaves between any two parts; and avoid “hidden” parallel fifths or octaves: that is, movement by similar motion to a perfect fifth or octave, unless one part (sometimes restricted to the higher of the parts) moves by step. In fourth species counterpoint, some notes are sustained or suspended in an added part while notes move against them in the given part, often creating a dissonance on the beat, followed by the suspended note then changing (and “catching up”) to create a subsequent consonance with the note in the given part as it continues to sound. As before, fourth species counterpoint is said to be expanded when the added-part notes vary in length among themselves. The technique requires chains of notes sustained across the boundaries determined by beat, and so creates syncopation. It is a common and pedantic misconception that counterpoint is defined by these five species, and therefore anything that does not follow the strict rules of the five species is not “proper” counterpoint. This is not true; although much contrapuntal music of the common practice period adheres to the spirit of the rules, and often to the letter of them, the exceptions are many. Fux’s book and its concept of “species” was purely a method of teaching counterpoint, not a definitive or rigidly prescriptive set of rules for it. He arrived at his method of teaching by examining the works of Giovanni Pierluigi da Palestrina, an important late 16th-century composer who in Fux’s time was held in the highest esteem as a contrapuntist. Works in the contrapuntal style of the 16th century—the “prima pratica” or “stile antico,” as it was called by later composers—were often said by Fux’s contemporaries to be in “Palestrina style.” Indeed, Fux’s treatise is a compendium of Palestrina’s actual techniques, simplified and regularised for pedagogical use (and so permitting fewer liberties than occurred in actual practice). Retrograde refers to the contrapuntal device whereby notes in an imitative voice sound backwards in relation to their order in the original. Dissonant counterpoint was first theorized by Charles Seeger as “at first purely a school-room discipline,” consisting of species counterpoint but with all the traditional rules reversed. First species counterpoint is required to be all dissonances, establishing “dissonance, rather than consonance, as the rule,” and consonances are “resolved” through a skip, not step. He wrote that “the effect of this discipline” was “one of purification.” Other aspects of composition, such as rhythm, could be “dissonated” by applying the same principle. Seeger was not the first to employ dissonant counterpoint, but was the first to theorize and promote it. Other composers who have used dissonant counterpoint, if not in the exact manner prescribed by Charles Seeger, include Ruth Crawford-Seeger, Carl Ruggles, Dane Rudhyar, and Arnold Schoenberg.